Makara Sankranti story: Lord Gauranga and Ganga! Gangadevi was thinking that Yamuna Mai is doing such wonderful service. The gopas are bathing in her and Krsna and Balarama are bathing in her and they are bringing the cows and the calves and the bulls to drink her waters and they are having all sorts of water sports and shes supplying such beautiful beautiful arrangements. Yashoda Mai is bathing Krsna in the Yamuna. Nanda Maharaj is taking bath in the Yamuna and Krsna and all His friends are having the most intimate loving lilas. And the gopis, Krsna standing on the bank of Yamuna playing His flute and Yamuna is stopping her waters and bringing Him lotus flowers. And then on the banks of the Yamuna the gopis are having rasa lila with Krsna and she is offering soothing soothing breezes for the pleasure of Krsna and Radhrani and gopis and then in the rasa lila, Krsna takes Radharani and all the gopis in the Yamuna and they are laughing together and playing together and hiding behind lotus flowers together and Yamuna is just serving serving – all she does is serve, facilitate love to facilitate pastimes. Ganga was not envious, Ganga was not jealous. Ganga was just so much happy to see the good fortune of Yamuna but was longing that she could do that service. So Ganga did tapasya and Krsna gave her the blessing – in Kaliyuga, Radha and Krsna will appear as Gauranga Mahaprabhu – and perform the same Braja lila in Navadvipa and you will be there to assist in every way. And she assisted – in every way! And Nimai when He was a little boy His mother would make all nice arrangements for Him to bathe in Ganga. When He was a student, practically for a major portion of the day Nimai and His students would just play in the Ganga – they splash everyone and spit water in the faces of brahamanas who were trying to do their gayatris – so many pastimes, playing in the Ganga almost all day Nimai and His friends – its like Krsna and the gopas. In fact they were Krsna and the gopas. What was Nimai’s love and faith in Ganga, 3 times a day He would bow down to her, worship her, honor her! He is teaching us what devotion is. And when scholar Kesava Kasmiri came to Navadvip, Nimai said, “O, you are the greatest of all pandits, Goddess Sarasvati appears on your tongue every time you speak. Please compose verses in glorification of Mother Ganga” and Kesava Kasmiri like the raging wind composed instantly a hundred verses glorifying Gangadevi. And it was there on the bank of the Ganga that Nimai liberated his soul, how? By taking away his ego so that he could be humble and grateful and then receive the mercy. And Mahaprabhu, He inaugurated the Sankirtana movement on the bank of Ganga and He took sannyasa at Katwa on the bank of the Ganga, bathed in the Ganga and then when He took sannyasa He went to Puri. 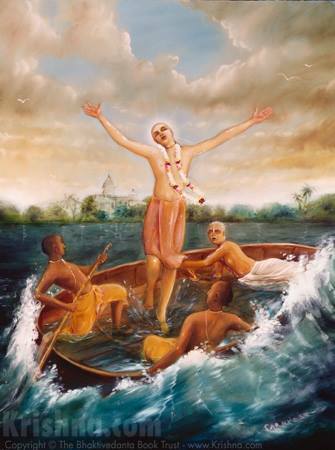 According to Vrindavana Das Thakur, Mother Ganga was so eager to continue assisting Lord Caitanya, He was bathing in her at least 3 times very day and sometimes he’d be there most of the day and she was just doing seva, offering her life for the pleasure of the Lord and His devotees but He is living in Puri. So Ganga was flowing very fast from Navadvipa to merge into the sea. At Ganga Sagar, she merges into the sea and then she rushed, her waters rushed to Puri because Lord Caitanya was bathing in the sea 3 times a day and she was there assisting samudra in facilitating the happiness of Lord Caitanya and His devotees. When Sri Caitanya Mahaprabhu decided to go to Bengal, what did He say? He said, “I come in 2 forms in this age of Kali – as wood and as water. As wood, I am Lord Jagannath and as water, I am Mother Ganga who have come to deliver the fallen souls of their sins and give love for Krsna”. And when Sri Caitanya Mahaprabhu was walking, he said at a point, “I’m going to Bengal for 2 reasons – to see my mother, Saci and my mother, Ganga”. And as He was on His way and He came close to the Ganga, He started glorifying “Anyone who bathes in Ganga, touches the Ganga, drinks Ganga, sees Ganga or anyone who is touched by a breeze that has come from the Ganga will get Krsna Prema – love for Krsna”. The breeze of Ganga can awaken love of god within us if we have the receptivity to digest that blessing. So to the degree we are humble, to the degree we are grateful, to the degree we really really deeply have a service attitude, to the degree we really have faith we will get mercy of Krishna. If you are really hungry then you can really appreciate food and assimilate it and digest it. So similarly that humility, that gratitude, that service attitude gives us a hunger for Krsna Prema, a hunger for service, a hunger to chant God’s names and then when we chant Krsna’s names, when we take bath in the Ganga, when we associate with Holy people, we get proportionate effects. Narottam Das Thakur in one song he explains that by bathing hundreds of times in the Ganga, one could be purified of sins and eventually love of God could awaken but just by seeing a pure Vaisnava the same effect is achieved because devotees of the Lord they are holy places personified. Therefore the real purpose of going on pilgrimage, whether its Kumbha Mela or going to Vrndavana or Navadvipa is to associate with holy people because the Ganga of the Hari Katha that is coming from their mouths, the Ganga of the blessings that are coming from their hearts is most valuable, priceless of all blessings. Those who go to the holy place just to bathe in the river without associating and seeking out saintly people are people of Kali yuga. Ganga is all merciful but without the blessings of saintly people and learning from them, we cannot access that blessing. And the most powerful current of grace in this age of Kali is Krsna’s Holy Names.